Where to begin. Like all journeys, the beginning of this sherry obsession is a little nebulous. My name is Seana (“shawna”) Yee. I first discovered sherry in 2013 whilst studying flamenco in Jerez. 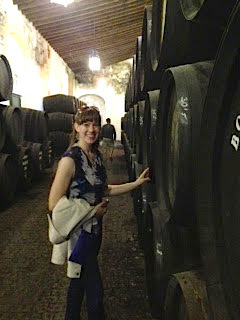 On a day off, I went on a tour at Bodegas Tradición. I honestly had no idea what I was drinking, but it truly captured my attention. For the drinking culture I am surrounded by in Portland, Oregon, very few are aware of what sherry has to offer! Oregon is known for its wine country, microbreweries, distilleries and microroasters, therefore I am compelled to motivate others to drink more sherry! My writing is not so much about the wines as is it is about the people who have touched these wines from grape to glass. I still have no idea where this journey is leading. I do work in the wine industry, but my passion is all things sherry. In September 2016, I am honored to officially be a Certified Sherry Educator!